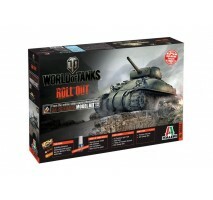 Scale model kits from World of Tanks series from Italeri that contains adhesive and in-game bonus codes! 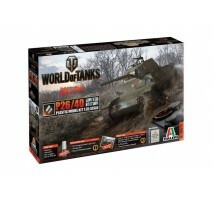 1:35 P26/40 Limited Edition - World of Tanks Skill: 3Model Dim. : 16,5 cmBox Dim. 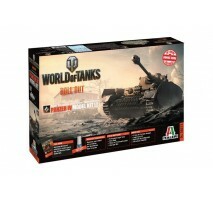 : 373 x 241 x 60 mm THE LIMITED EDITION BOX CONTAIN: 1 MODEL KIT - 1 LIQUID CEMENT - 1 TANK GUIDE - 1 POSTER (42x29,7cm) - WORLD oF TANKS DECALS - INVITE COD..
1:35 M4 SHERMAN - World of Tanks THE BOX CONTAIN: 1 MODEL KIT 1 LIQUID CEMENT 1 TANK GUIDE WORLD oF TANKS DECALS 3 INVITE CODES 1 BONUS CODE The M4 Sherman medium tank was the primary tank used by the United States during World War II. It was the fi..
1:35 PANZER IV - World of Tanks Skill: 3Model Dim. : 20,0 cmBox Dim. 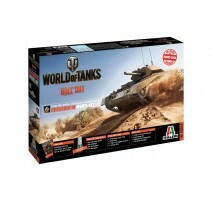 : 373 x 241 x 60 mm 1 MODEL KIT - 1 LIQUID CEMENT - 1 TANK GUIDE - WORLD oF TANKS DECALS - 1 INVITE CODES - 1 BONUS CODEThis medium tank was the most mass-produced German machine..
1:35 CRUSADER III - World of Tanks 1 MODEL KIT - 1 LIQUID CEMENT - 1 TANK GUIDE - WORLD oF TANKS DECALS - 1 INVITE CODES - 1 BONUS CODE Skill: 3Model Dim. : 17,0 cmBox Dim. : 373 x 241 x 60 mmModification of the Crusader III was the last serial mo..